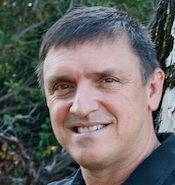 Dr. Bill Giovannetti is a professor at A.W. Tozer Theological Seminary and the senior pastor of Neighborhood Church of Redding. An experienced speaker and author, Bill informs the mind in ways that touch the heart. He enjoys life with his wife and two kids in northern California. For more information about Bill and his other books, visit http://maxgrace.wordpress.com and http://fourletterwords.org. Four Letter Words is his second book. Bill hates legalism, loves grace, and teaches that God is infinitely more committed to us than we will ever be to him. He is a graduate of Trinity Seminary and earned his doctorate at Fuller Theological Seminary. When The Questions Are Hard…And The Answers Unpopular…Will You Stay Devoted To Christ? 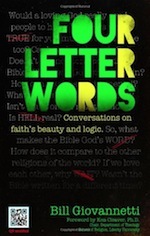 Four Letter Words by Dr. Bill Giovannetti is a book that examines common questions about faith, truth, evil, the Bible, hell, etc. It covers 9 four letter words: “True”, “Know”, “Pain”, “Ouch”, “Evil”, “Word”, “Damn”, “Wait”, and “Hope”. The author goes over different religious worldviews and asks which one truly satisfies our questions and longings. The only one that I am willing to put my faith in is Christianity. He feels the same way and does a good job of showing why. He also makes the case for absolute truth. I think that this book will be great for seekers, new believers, and skeptics. Those who have already studied opposing worldviews and apologetics will not find much new material. It is still nice to hear basic truths again. Four Letter Words contains QR codes that allow you to dig deeper and take advantage of further resources. The chapters end with “Talking Points" (advice and stuff you can discuss with your friends/seekers/etc. that is related to the chapter’s topic). What's Four Letter Words about, and where did you get the title? Four Letter Words is about defending your faith in Christ. If you've ever felt tongue-tied standing up for Jesus, this book can help. Even though our culture claims tolerance as a virtue, that tolerance stops at Christianity's front door: witness the hostility directed toward a sincere Christ-follower like Tim Tebow. Judging by reactions to him, you'd think he just cussed out his grandma when all he did was say a word for Christ. Speaking God's truth and living your faith is quickly becoming today's profanity. Tougher days are coming; we need to get ready. There has never been a truth-system more satisfying, consistent, logical and beautiful than Christianity. I wanted to help God's people rise up and say so. Did you ever struggle with your faith? How did you work through that? Even though I've been a pastor for a long time, I struggle with my faith a lot. My earliest struggles – back in high school days – centered on scientific stuff, like evolution. In the book I tell the story of how I made peace with faith in a Creator God and how I fit together science, logic, and the gospel in my own heart. Now that I'm a bit older, my struggles come more out of pain and suffering. Why does God let people hurt? I cover those topics too. Struggles are normal – we just can't let them overwhelm our faith or uproot our joy. It's super-important for us to know every question raised against Christianity has an answer. I try to provide some of those answers along with simple talking points for everyday conversations. If I read this book, what will I get out of it? 1. Clarity: Know what you believe. 2. Confidence: Know why you believe. 3. Courage: Know what to say when you don't know what to say. ~I received this book free of charge via Litfuse in exchange for my honest review. To read other reviews of this book, visit here. Alyssa, I have advanced theology degrees and taught preaching at a seminary for a few years. I now teach World Religions, The Life and Teachings of Jesus, and The Teachings of Paul. I guess I'm one of those who "won't find new material," but you're absolutely right that it's nice to hear basic truths again. No matter how much we study, we don't outgrow the basics of the faith. This sounds like a book worth looking into, and I thank you for your thoughts.